What Else Can I Expect from an Online Forensic Psychology Program? Forensic psychology is a specialized field that transcends psychology, law and criminal justice. Forensic psychologists play an important role in criminal investigations by examining evidence, interviewing suspects and pinpointing motives for committing certain crimes. They are also prominent in the justice system, often evaluating defendants or witnesses to determine if they are fit to participate in trial proceedings. They may also make sentencing recommendations for convicted criminals. 'Psychology' and its subfields (such as behavioral psychology) are among the most popular majors for bachelor's degree-seekers. In many cases, students earn a bachelor's in forensic psychology as part of a specialization program; these pathways include course sequences concentrated in niche areas of forensic psychology. However, it should be noted that most careers in forensic psychology require an advanced education; most job candidates enter the workforce with at least a master's degree, and many have also earned a doctorate. Many of today's students are choosing to earn their bachelor's degree in forensic psychology online, rather than in a classroom. Online students follow the same challenging curricula and rigorous study schedule as their brick-and-mortar counterparts, leading to the same number of post-degree employment opportunities. The asynchronous (or self-paced) format of most online programs is also ideal for students with part-time jobs, childcare duties and other responsibilities that may interfere with campus-based learning. Learn more about what you can do with an online bachelor's degree in forensic psychology and what kind of career opportunities you can look forward to with this comprehensive guide. WILL AN ONLINE FORENSIC PSYCHOLOGY DEGREE PROGRAM PROVIDE ME WITH THE SKILLS I NEED TO ADVANCE MY CAREER? For forensic psychology students, the undergraduate curriculum typically involves a mix of general and abnormal psychology, law, criminal justice and anthropology. In addition to standard coursework, these bachelor's programs usually include internships and/or clinical residencies; these onsite courses allow students to receive supervised, hands-on training from experienced professionals. A comprehensive capstone project may also be required. A bachelor's in behavioral psychology will equip students with foundational knowledge and skills needed for advanced education at the master's and doctoral levels. WILL AN ONLINE FORENSIC PSYCHOLOGY DEGREE PROGRAM WORK WITH MY SCHEDULE? Online forensic psychology bachelor's programs offer a flexible alternative to traditional undergraduate education. Students can access course readings and lectures, participate in virtual discussions with fellow students, submit written assignments, take exams and communicate with their professors on their own time. The latest technology also enables them to study away from their home computer using a laptop, tablet, smartphone and other portable Wi-Fi devices. For added convenience, online psychology students can usually coordinate internships, residencies and other onsite courses at locations within a reasonable distance of their current address. WHAT JOBS CAN I GET WITH MY BACHELOR'S IN FORENSIC PSYCHOLOGY? A bachelor's degree in forensic psychology will, on its own, be insufficient for most careers in this field. In most cases, an advanced degree will be required. However, an online bachelor's program in forensic psychology with practicum courses will prepare students for the challenges and demands of graduate-level education. Alternatively, employees with a bachelor's in forensic psychology may be qualified for certain job roles, such as forensic scientists, crime analysts or crime scene investigators. WHAT ARE THE BEST ONLINE BACHELOR'S IN FORENSIC PSYCHOLOGY PROGRAMS? Choosing a program is an incredibly personal decision, and only you can properly evaluate whether a target school's strengths match your educational needs. The following ranked list of schools should serve as a helpful starting point in your search for the best online bachelor's degree in forensic psychology programs in the United States. Our ranking is based on the courses schools offer, available specializations, student outcomes, career support services, and other criteria used to determine academic excellence. If you are considering an online bachelor's in forensic psychology, be sure to contact admissions specialists at different colleges and universities to learn more their about specific bachelor's degree requirements and offerings. Considered the largest Christian university in the world, Liberty University boasts an online enrollment of more than 94,000 students. There are 78 undergraduate online programs, and online students enjoy a 17:1 student-to-faculty ratio. Liberty's Office of Online Student Life works to connect online learners through student groups, counseling services, and prayer requests. Liberty offers one of the best online forensic psychology degree programs. Its Bachelor of Science in Psychology - Criminal Psychology is part of its School of Behavioral Sciences. The program provides students an overview of the U.S. criminal justice and corrections systems. It requires 120 credit hours, including: core competency courses like communication and critical thinking, three Christian Life and Thought courses, and skills and knowledge courses. Major requirements comprise 54 credit hours and range from behavior modification to abnormal psychology. Liberty awards "prior learning and experience" credits, which can be proven by exam, military or job training, portfolio, and/or taking a Liberty online course. Arizona State University-Tempe offers a 120-credit online bachelor of science in psychology with a concentration in forensic psychology that includes laboratory and advanced statistics coursework. The online degree incorporates biological and neuroscience components of psychology into forensic study, providing a clinical approach for students who want to work in or continue studying forensic psychology. Students complete core classes in research methods and criminology and choose courses within three focus areas: neuroscience, forensic science, or social/developmental psychology. The internship within the online forensic psychology degree provides students with supervised practical experience. The degree also prepares students to enter careers in neuropsychology, behavior health, and crime scene investigation. First-year applicants must provide high school transcript information with a GPA of 3.0 or higher, must be in the top 25% of his or her graduating class, or must have an ACT score of 24 or higher (22 for in-state students) or 1110 or higher on the SAT (1040 for in-state students). SNHU offers a forensic psychology degree online with its BA in Psychology - Forensic Psychology. This 120-credit program has a liberal arts basis with specialty courses, including biopsychology, sociology of the family, and statistics for psychology. The program is designed to develop research, critical thinking, and problem-solving skills for criminal investigations. Students learn about criminal profiling, motives for criminal behavior, and how psychologists serve as expert witnesses during trials. Instructors have real-world experience. The online SNHU Psychology Club is available to degree participants. SNHU serves 60,000 online students and delivers a variety of online education services like tutoring, tech support, an online library, and writing center. Online courses are available 24/7, and students can select from six nine-week terms per year. Courses are $960 each, and financial aid is available. Active-duty service members and their spouses receive a 30% tuition discount. There is no application fee. Located in Eugene, Oregon, Northwest Christian University's academic programs are tied closely to the school's Christ-based community. The bachelor of science in psychology with an emphasis in forensic psychology at Northwest Christian University is ideal for students who plan to pursue graduate study in the field. Students earning the forensic psychology degree online learn about criminology, corrections, law enforcement, and the criminal justice system while exploring how people learn and interpret information. Coursework within the concentration includes psychometrics, the psychology of addictive behaviors, and the psychology of trauma. Graduates of the program can pursue entry-level positions in corrections, law enforcement, victim advocacy, and private security and pursue graduate degrees, licensure, and certifications for further career advancement. Admission to Northwest Christian University requires completion of the online application and submission of official transcript information. The online forensic psychology degree at Eastern Kentucky University is offered in accelerated eight-week terms with six start dates per year. Courses in the Bachelor of Science in Psychology - Forensic Psychology program include forensic assessment, mental health law, and criminal behavior theories. Some courses are administered through the EKU College of Justice and Safety. The program requires 120 credit hours and costs $400 per credit hour. Financial aid, military benefits, and employer tuition reimbursement are available. Online students enjoy the same courses and faculty as on-campus students. They also have a dedicated academic advisor and individualized degree mapping. Online tutoring, co-op participation, student-faculty research projects, and Psi Chi and other networking groups are available to online students. EKU uses the Blackboard online learning platform. The university's libraries will ship books to any student outside of the school's service area. Students who complete this program may pursue graduate school or entry-level positions in victim advocacy, the court system, and crime analysis. National Louis University, located in Chicago, offers an online forensic social justice major through the bachelor of arts in criminal justice program. The degree is also available in a blended format with coursework delivered both online and on campus. The 180-credit forensic social justice degree emphasizes the psychology of criminology and how to apply it to people, communities, and interventions. The general education and core requirements for the the criminal justice and forensic social justice majors are the same, but courses for the forensic social justice major are highly specialized. Coursework includes violence and aggression in the family, child abuse and neglect, theories of personality, and crisis intervention principles and practices. Students learn about why people commit crimes, the social and community effects of criminal behavior, and how human services and family dynamics may affect diagnoses and intervention. For admission to the program, applicants must complete a minimum of 60 credit hours in general education. Transfer applicants may be able to receive credit by examination, portfolio, and proficiency as well. The Florida Institute of Technology offers a forensic psychology degree online that focuses on forensic psychology's relationship with law enforcement and the legal system. The BA in Applied Psychology - Forensic Psychology concentration program covers topics that include investigative techniques, criminal behavior, and courtroom procedures. Courses consist of integrated theories of crime, courtroom psychology, and principles of individual and community advocacy. The degree has a liberal arts foundation, so core courses in writing, communication, and the humanities are required. There are 40 courses within this program, and each one takes eight weeks to complete. There is no application fee. Online classes feature videos, interactive media, chat rooms, and discussion boards. Classes are asynchronous, so students can participate at their convenience. Assignments are given weekly, and some group projects are required. Tech support is available 24/7, and faculty interact with online students via phone, email, live chat, and discussion board. Online tutoring, an online library, and career management services are also available. Mary Baldwin University in Staunton, Virginia "empowers leaders to pursue lives of purpose in a changing world." It offers a forensic psychology online as either a BA or BS in psychology with an emphasis in forensic psychology. A core curriculum includes courses in the arts, humanities, and natural sciences. The forensic psychology courses instruct students on pretrial publicity effects, working with special victims, assisting lawyers, and protecting victim rights. Elective courses include abnormal psychology and adult development. All psychology majors must take "Survival Skills for the Psychology Major", a one-credit class that gives students a basic idea of what working in the field entails. Mary Baldwin is an approved SARA Institution (National Council for the State Authorization Reciprocity Agreements). Students may transfer up to 18 credits (or six courses) through direct course equivalents from the Virginia Community Colleges System. 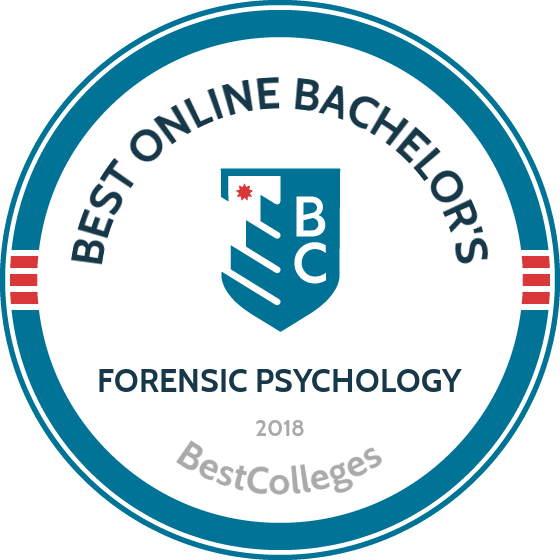 The bachelor of science in forensic psychology online degree offered by Faulkner University blends psychology with the fundamentals of criminal justice. A Christian institution in Montgomery, Alabama, Faulkner University trains students in the areas of criminal behavior, interrogation techniques, and conflict management as they relate to the field of psychology. The 121-credit online forensic psychology degree is ideal for individuals who want to work as trial consultants, forensic psychology researchers, and expert witnesses. Applicants must have a high school diploma or documentation of a GED and must submit ACT or SAT scores if they have been out of high school for fewer than five years. Minimum scores of 18 on the ACT and 1290 for the SAT are required for admission, although conditional admission may be granted. Union Institute and University, based in Cincinnati, Ohio, offers an online bachelor of arts in psychology with a concentration in forensic psychology. The 120-credit program focuses on the relationship between law and psychology. Core courses cover the principles, ethics, and practice of psychology. Concentration courses cover areas such as forensic science and criminology, emerging trends in forensic science, psychology and the law, and criminal behavior. Students also complete a capstone portfolio that involves a series of self-assessment exercises intended to help them in their future careers. The online forensic psychology degree is available to full- and part-time students, with the option to transfer as many as 90 credit hours into the program. Graduates with a bachelor's degree in forensic psychology should expect a relatively poor job outlook. The Bureau of Labor Statistics (BLS) notes that the median unemployment rate for a bachelor's degree-holder in the U.S. is 2.8%; by comparison, the median unemployment rate for associate degree-holders is 3.8%. However, unemployment rates are somewhat high for forensic psychology bachelor's degree recipients due to the specialized nature of this field and the demand for employees with advanced degrees. Using data from the National Center for Education Statistics (NCES), the following table below compares unemployment rates of college graduates between the age of 25 and 29, based on their undergraduate major. As the table indicates, the unemployment rate for psychology degree-holders is fairly middle of the road compared to other undergraduate major fields of study. This figure is also higher than the unemployment rate for all occupations, which is currently set at 4.8%. The earning potential for employees with a bachelor's in forensic psychology will largely depend on their specific job title. Other factors to consider include experience level and city/state of employment. The next table looks at career salary growth rates for four of the most popular professions in forensic psychology; each occupation listed is attainable with a bachelor's degree or less. All four occupations reported a career salary growth rate of at least 35%. Forensic computer analysts experience the highest growth: an impressive 87.6% increase between the entry-level and late-career phases. Crime analysts ranked second with 67.7% growth after 20 years in the workforce, followed by forensic scientists with 46.8% growth. Students who earn an online bachelor's in forensic psychology will be well-positioned for the demands of a master's and/or doctoral degree program. However, these graduates may also be able to enter the workforce and compete for entry-level jobs. Four common career paths for individuals with a bachelor's in forensic psychology are outlined below. Forensic Science Technicians: Forensic science technicians collect, analyze, record and store evidence used in criminal investigations. Their findings are often used to solve crimes, apprehend suspects and charge guilty criminals. Their day-to-day duties often involve a mix of crime-scene fieldwork and lab-based research. Detectives and Criminal Investigators: These individuals are responsible for investigating crimes, interviewing witnesses and bringing guilty parties to justice. In the U.S., detectives and investigators may work at the federal, state or local level. Many begin their careers as police officers, and advance through on-the-job experience and professional training. Private Detectives and Investigators: Private detectives and investigators provide services to clients seeking information about legal, financial and/or personal concerns. They often research people they are investigating through criminal background checks, financial histories and other personal information. Most states require private detectives and investigators to be licensed. Unlike police detectives and investigators, these individuals are usually self-employed and are not affiliated with government law enforcement agencies. Accountants and Auditors: Accountants keep track of organizational or personal financial records to ensure their clients are complying with all applicable laws and regulations, while auditors are specialized accountants trained to spot discrepancies and omissions in financial statements. Many of these professionals work in the field of forensic accounting, which involves investigations of individuals or organizations suspected of committed fraud and other financial crimes. For more information about opportunities for grad students and more advanced careers in this field, please visit our Guide to Online Master's in Psychology Programs. Making professional connections and learning about different approaches to forensic psychology is crucial to your success. Professional organizations offer a great entry point for students who want to learn more about their chosen career path. Below you'll find three of the country's most prominent organizations established for behavioral psychology professionals. These organizations host networking events, provide online trainings, maintain active job boards, and offer other services for career-ready college graduates. American Board of Forensic Psychology: The ABFP oversees board certification for certified forensic psychologists. The website features information about forensic psychology bylaws, a comprehensive calendar of examination dates nationwide and other helpful resources for people seeking certification in this field. International Association for Correctional and Forensic Psychology: Founded in 1954, the IACFP today serves a global community of behavioral scientists, practitioners and psychologists. Members receive discounts on dozens of online academic journals, invitations to association events and access to restricted areas of the website, among other benefits.